SOCAmps Mobile CRM provides an intuitive way to approach CRM exclusively for the Mobile Sales Organization, where Sales Agents day-in & day-out are moving everywhere to meet their clients and close deals. This is a very fragmented approach to Sales. Updating CRMs should not be such a hassle, but should be as easy as updating your trusty Sales Notebook. For them updating a CRM after a long day’s work is as tiresome as when you ask a sportsperson to report on his actions on the field. Mostly, their basic CRM becomes the Notebook they carry along with them to all these Sales Calls. 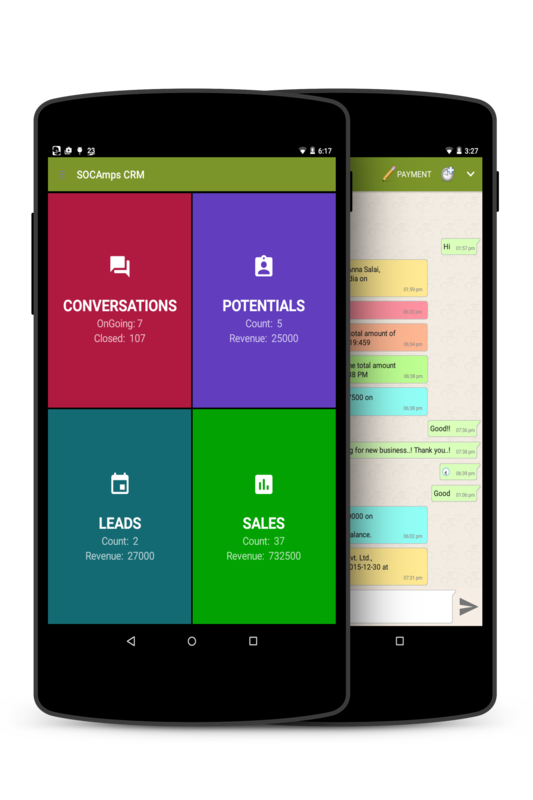 SOCAmps Mobile CRM achieves just that, it becomes the Sales Agent’s trusty notebook as well as the best CRM for updates. These updates you do in the SOCAmps Mobile CRM are automatically uploaded to the cloud to generate the necessary Analysis & Reports as required by the Sales Manager and the Owner. With SOCAmps Mobile CRM, You Are Always Just a TOUCH Away. SOCAmps CRM allows you to track all your meetings and schedules and reminds you to accomplish those commitments. A timely follow-up means a definite order. SOCAmps CRM allows you to keep track of all previous conversations and lets you address your Customer based on their history as well as their specific requirement promptly. SOCAmps CRM allows you to keep track of your Sales Agent’s Customers, Potentials, Leads and enables you to accomplish their daily tasks promptly and on-time. When you are in discussion with your Customer, you tend to rely on your memory on the previous conversations, discussion & more such tidbits about your customer. SOCAmps CRM makes sure you rely on recorded facts on those Customer interactions to make sure you are in track to close the sale.